McElroy Metal is proud to be the preferred metal roofing supplier of residential and commercial contractors, builders and end-users throughout the U.S. We feature manufacturing facilities in Ashburn and Peachtree City, Georgia, where we manufacture our large assortment of high-quality metal roofing products under tightly controlled conditions, using only the best materials. You’re assured of building, repairing or retrofitting your roof with a solid product that will stand the test of time.For the past 50 years, commitment to service has been of vital importance to McElroy Metal. With a network of Service Centers across the United States, we can get our metal roofing products into the hands of our customers as quickly as possible. One of our facilities is located in Savannah, GA and provides superior service to our distributors, contractors and other end users in southern Georgia and beyond. Unlike some of our competitors, you’ll never have to wait for your product to be shipped from halfway across the country. Our fully stocked Savannah service center has all the metal roofing products you’ll ever need in one convenient location. Our selection includes many varieties of exposed and concealed wall fastener, canopy, soffit and insulated roofing panels, as well as complete retrofit and standing seam systems, and much more. All metal roofing products are manufactured from only the best materials to ensure they will maintain their quality and aesthetic appeal for years to come. Many customers now require the use of environmentally friendly building materials in every aspect of their construction projects — including the roof. Our extensive product line includes multiple green options that combine environmentally friendly features with unsurpassed quality. They’re the perfect choice for residential and commercial property owners who are looking for a sturdy, reliable roofing system that will also contribute to lower energy costs. With so many fantastic metal roofing products from which to choose, finding the ideal option for your building project can pose a challenge. The professional staff at our Savannah service center will do whatever it takes to help you make the right decision. We’ll take the time to ask questions to evaluate your project specifications and make the best choice based on your needs and budget parameters. You’ll be able to move forward with your purchase with total confidence. 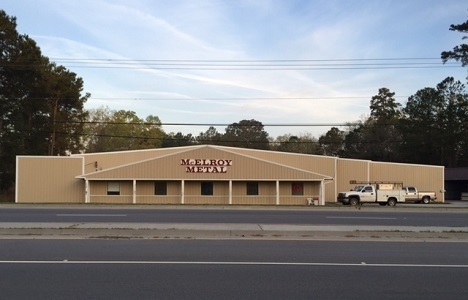 While some of our competitors make selling metal roofing a take it or leave it proposition, we take a more flexible approach at McElroy Metal. Understanding that no two projects or customers are alike, we will work with you to develop a metal roofing solution. Just let our Savannah service center staff know what you need. As a McElroy Metal customer, you’ll have access to an abundance of online tools and resources to boost your metal roofing knowledge and customize your design. Our interactive visualizer enables you to download sample designs and even input your own design to make modifications. You can also use our numerous color charts to pick the perfect color that complements the rest of your structure. Give our Savannah Service Center a call whenever you need us. Feel free to stop by to meet our team and get an in-person look at our metal roofing product selection — we’re located at 1365 Dean Forest Road.Unlike some of our competitors, you’ll never have to wait for your product to be shipped from halfway across the country. Give our Savannah Service Center a call whenever you need us.